2014.08 - Free Kick Official HP！! 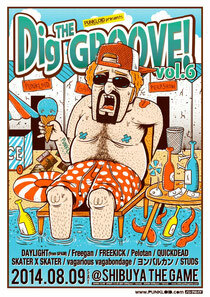 DAYLIGHT(from SPAIN) / Freegan / Pelotan / QUICKDEAD / SKATER X SKATER / and more!!! HOTSQUALL "BEST TOUR 2014 『Laugh at Life』"
RYOJI & SKA PUNK ZOMBIES / THE GELUGUGU / SNAIL RAMP / SKA FREAKS / CHANGE UP / SPLASH / OVER LIMIT / SKALAPPER / vagarious vagabondage / Black Cat’s Tail / NO SWEET / …and more !